In Dead Space, it’s the 26th Century and you’re Isaac Clarke, an engineer sent to repair the interplanetary mining ship USG Ishimura, near the planet Aegis VII. Seems simple enough — another day, another dollar — until the whole thing gets shot to hell and you end up having to fight for your live against zombified Necromorphs while simultaneously uncovering a conspiracy involving the Church of Unitology and wondering just where your girlfriend, Nicole Brennan, who was assigned as a medical specialist to the Ishimura could have got off to. Sounds like the makings of some serious trouble, but fortunately ol’ Isaac‘s got a pressurized suit that along with keeping him alive, goes great with his plasma cutter, flamethrower and ripper. The EA game was a Game Informer game of the month and has picked up numerous awards for its sound design, atmosphere and overall quality. 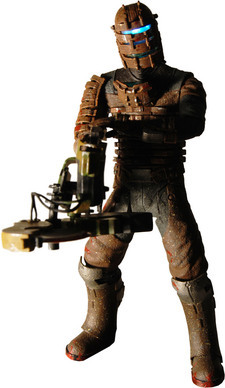 NECA is proud to reveal two new figures of Isaac Clarke based on his appearance in Dead Space. Both the standard Isaac with the plasma cutter and the bloody variant with the ripper come with a light up LED mask and back and over 20 points of articulation. With ball joints at the neck, shoulders, wrists and ankles as well as ball hinges at the knees and elbows, left swivel biceps, a swivel waist and T crotch with hinged swivel hips, Isaac has the flexibility to take on whoever — and whatever — he might encounter aboard the Ishimura. NECA‘s Dead Space figures are available September 2009 in stores and online at our own Amazon storefront . Stay tuned to necaonline.com for more info on this and other lines from your favorite games and movies.